Lest you think all music schools are the same, the Gasse School of Music has a unique approach to getting students hooked on music. I should know. I’m personally grateful to Gasse School for introducing me to the world of music through piano lessons. I was even more impressed with the school when I observed co-founder Daniel Gasse and his young sons, (Ernesto, eight, Antonio, five) played a mini-concert at a local college. They formed a cello trio, with the boys displaying advanced technique and good tone quality. But it wasn’t so much the sound they produced that captivated the audience. It was the smiles they wore, as they chased their dad up and down the scales. Unlike traditional teachers, Daniel introduces his students to “the difficult part” of playing the cello right away. He also doesn’t confine them to years of playing the lower octaves. Daniel, his wife Sarah, and the other three instructors at Gasse must be doing something right. Since opening their doors to nine students on June 1, 2001, they now have taught more than a hundred budding musicians. They teach an additional sixty students aged 3-6 at local pre-schools. “We have great retention,” Daniel said. “Some students have been coming here for twelve years. They start in fourth or fifth grade and go all the way to college.” Gasse teaches a large spectrum of ages, from three years-old to students in their 60’s. 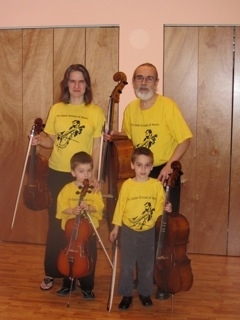 In addition to cello and piano, Gasses instructors teach the viola, violin and guitar. How do the Gasse instructors keep them coming back for more? “Pride or fun are the main motivations,” Daniel explained. “Some are proud to be first cello in their school orchestra. Others have fun playing music with their friends.” Friendships grow out of the string quartets that are formed at the school. Besides learning to become team players, these musicians can make a few dollars playing at parties and weddings. The key for any successful music school is to get students to practice. Unfortunately, there’s no set formula. “We have to reach each one as an individual and give them what they need,” Daniel said. “Some are good readers but can’t play in tune. Others have great rhythm but can’t read music. Students also learn to play with joy on their faces like Ernesto and Antonio. I’m living proof that anyone can play the piano. My nightly practice sessions may not lead to performances but I get a kick out of learning new songs and mastering old ones.